On May 19, Sweden won the 2013 Men’s Ice Hockey World Championship defeating Switzerland. 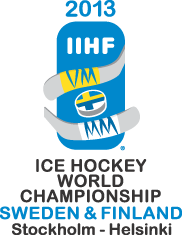 Sixteen countries participated in the Championship games which were held in Stockholm, the capital of Sweden, and Helsinki, the capital of Finland. The ice hockey game played at the 1920 Summer Olympics is regarded as the start of this tournament, which is now played every year. Men’s ice hockey is known as one of the world’s fastest and most rough team sports. It is fast because the players are zooming around on ice skates, hitting a rubber “puck” which can travel at very high speeds. It is rough because players are actually allowed to use their hips or shoulders to hit other players to slow them down. Spectators don’t go to watch just the fast action, but also all the pushing around. Talking about rough, the referee used to put the puck on the ice between the players’ sticks to start the game. The players would jump on the puck so quickly that often the referee’s hands would get bruised. In 1914, the rule was changed and the referees were allowed to drop the puck. You can watch the highlights from the Sweden vs Switzerland match here. Ice skates have been discovered in northern Europe from about 5,000 years ago. They were made from bones of large animals.